UNITED NATIONS, August 8 -- Sudan opposing a medevac helicopter for injured peacekeepers in Abyei who later died will be the subject of a UN Security Council meeting Monday afternoon. Yet to be answered is what planning the UN did for medevac, including from Wau in South Sudan, before paying to deploy over 1000 Ethiopian peacekeepers to Abyei. This is what Inner City Press on Monday asked UN Secretary General Ban Ki-moon's deputy spokesman Farhan Haq about: does the UN believe it needs permission before flying a helicopter in from another country, and what planning was and is being done, to ensure more peacekeepers don't needlessly die? Video here, from Minute 4. Haq said that outgoing Department of Peacekeeping Operations chief Alain Le Roy will discuss this with the Security Council, adding that "the main issue is the vital need to get airlift as quickly as possible." Obviously that's true. But one can imagine, for example, that Afghanistan and Pakistan might block or delay flights of even medical helicopters in from each other's territory. This is so foreseeable that to not consider it in advance is negligence. 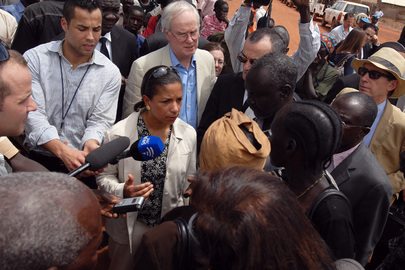 When Inner City Press reported on the Security Council negotiations around their resolution on the Abyei mission UNISFA and to wrap up the old UN Mission in Sudan, that no Status of Forces Agreement between the UN and Sudan had been signed was admitted on the sidelines to be a major issue. Alain Le Roy told Inner City Press on August 4 that the "old UNMIS SOFA is in place." But that SOFA was drafted between South Sudan was a country independent from Khartoum. This was an obvious problem. Even before South Sudan's July 9 independence, when the Security Council traveled to Sudan earlier this year there was a big debate about how to fly to Abyei: through Wau or Kadugli, where ICC-indicted Southern Kordofan governor Ahmed Haroun might try to greet the Council on the tarmac. So this was a foreseeable problem. Will the UN continue to lack transparency in its planning, including for peacekeeper safety, and will the Council be any more forthcoming? Some have said the situation in Southern Kordofan will also be addressed at the Council's meeting Monday afternoon. We'll see. Footnote: Inner City Press asked Haq if Ban Ki-moon, DPKO or the Secretariat has any comment on Khartoum confiscating the press run of the newspaper Al Ahdath for reporting on the SPLM-North and on corruption. Haq had no comment, saying that the UN "agency dealing most with press freedom is UNESCO." So the UN has three peacekeeping missions in and around Sudan, but has nothing to say? Quiet diplomacy indeed.